Yanira Castro is a structural obsessive. She is an art scientist. She sees the rules and patterns lurking just beneath the surface of things. The stuff that’s easier not to see. Her company—a canary torsi—is an anagram of her name. This should tell you almost everything you need to know: chaos staring at itself in the mirror, finding order. Yanira is not, however, a computer. At least not all the way. These are real human beings on the stage, after all. The algorithm which determines, for example, which text will be spoken at any given moment of CAST, and by whom, is not just digitally clever; it is also a catalyst for very human stuff—for humor, for struggle, for humility, and for mess. And don’t forget: these texts which are so carefully (and gleefully?) code-mangled come from real human experiences and speak to real human frailties. The system is designed to confront its own limits, to grind its own gears, and ultimately, to fall apart; or to succeed, but just barely. There’s a non-zero probability that Yanira Castro is the Rube Goldberg of contemporary dance. 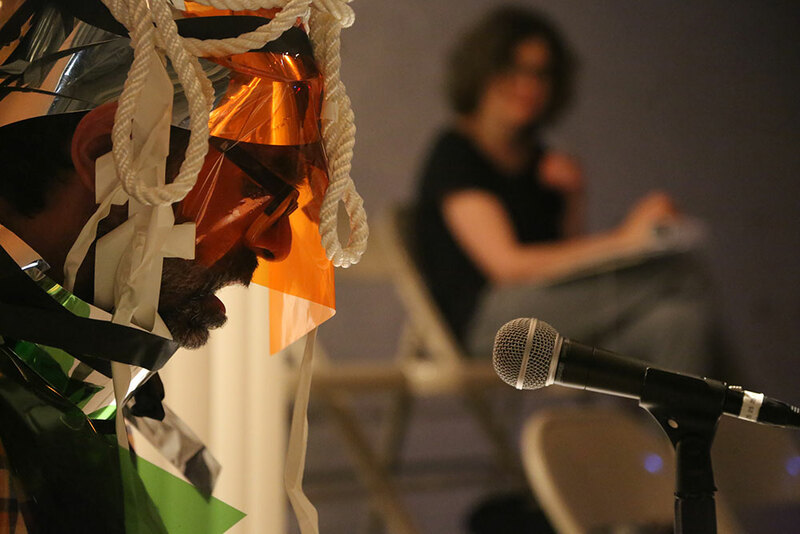 CAST, STAGE, AUTHOR is three works in one—two live performances and an interactive installation—drawing from audio and video “archives” generated with and by fifteen very accomplished New York-based performing artists. It concerns itself with the processes (systems…?) of performing and casting, and the complexities of representation. It uses The Chocolate Factory, the stage of the Playhouse at Abrons Arts Center, and the gallery of The Invisible Dog. It uses these spaces concurrently (has this happened before? I’m not sure). It’s quixotically ambitious. It’s a puzzle I do not wish to figure out. It’s a BEAR. Yanira Castro first showed her work at The Chocolate Factory in 2006. I’ve seen pretty much everything she’s done since then. Yanira says that her work “persists in the idea that live performance is uneasy communal action” and she is definitely picking at that nerve. Once I was made to dance a duet with Peter Schmitz at The Invisible Dog (in retrospect, that was fun). The piece we presented in ’06 was called (fetus)twin fet(us)twin and it was icy and weird and incredibly architectural (by which I mean, perhaps, that the foundation might have been invisible but it was most definitely there). Even the sound was architectural (see also: “writing about music is like dancing about architecture”). I just changed my mind. Yanira Castro is not an art scientist. She’s an art architect. An artchitect. Her relationship to the spaces in which her work occurs is intimate and studied. In CAST, STAGE, AUTHOR, she brings several spaces (and their individual architectural personalities) into conversation. And by doing this, by taking a big bite from a pie that just gets smaller and smaller, she conducts a kind of stress test on the architecture of the (very shaky, it turns out!) performing arts field itself. Brian Rogers is a director, video and sound artist, co-founder and artistic director of The Chocolate Factory Theater. Since 1997, Brian has conceived and/or directed numerous large scale performances at The Chocolate Factory and elsewhere including Hot Box (September 2012, co-presented with FIAF’s Crossing The Line Festival / January 2013, PS122’s COIL Festival / February 2013, EMPAC Center, Troy NY – supported by a MAP Fund grant), the Bessie-nominated Selective Memory (July 2010, Mount Tremper Arts / September 2011, The Chocolate Factory / January 2011, PS122’s COIL Festival). Brian recently completed his first feature film; composed the soundtrack for Shaun Iron & Lauren Petty’s film Standing By: Gatz Backstage; and has collaborated as a sound and video artist with numerous experimental dance and theater artists in NY and elsewhere. CAST, STAGE, AUTHOR was co-commissioned by Abrons Arts Center, The Chocolate Factory Theater, and The Invisible Dog and ran September 7-21, 2017.